Allo Nature is a brand of organic and natural cosmetics for women and men. Our products are thought and designed for professional use in beauty salons or for individuals. Our goal is to enhance the natural beauty of our customers with ingredients from organic farming. Most of our products are ECOCERT certified and COSMEBIO labeled . Thanks to Allo Nature's care, your skin is protected against external aggression for a long time, your silhouette is toned and your skin nourished and hydrated in the long term. The Allo Nature team is made up of beauty professionals to offer increasingly innovative formulations, sensory and natural to our customers. Allo Nature also trains professionals in various aesthetic techniques in order to better support them in the use of our products, and allow them to offer new services to their customers. 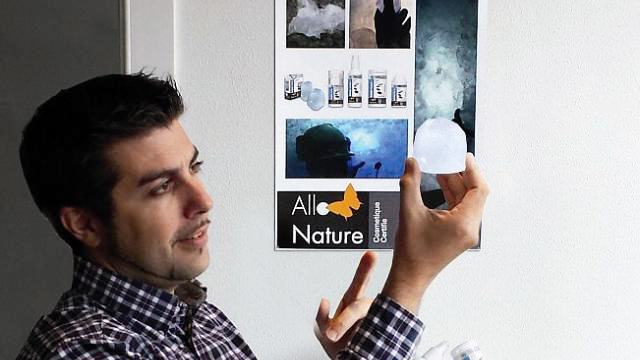 Emmanuel Bardin (President of Allonature) showing the natural alum stone of Allonature.